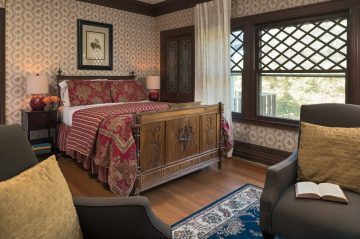 Nestled on the third floor, the recently redecorated Clemens Suite offers views of the front and rear gardens. The private stairway leads up two rooms with an adjoining bath. 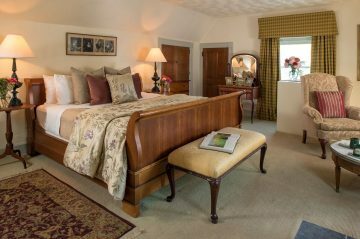 Located at the far end of the second floor, the English Garden Suite is spacious, bright and private. 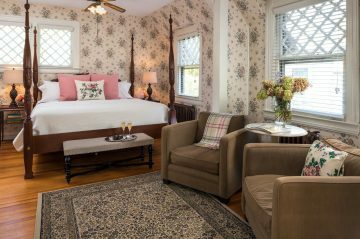 It offers a king size four poster bed, lovely original hardwood floors, an antique armoire and a comfortable sitting area. 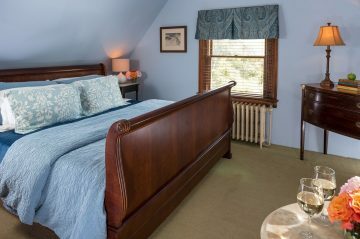 This inviting suite on the second floor has a queen bed, a cozy sitting area overlooking the front grounds and a large whirlpool tub with shower. 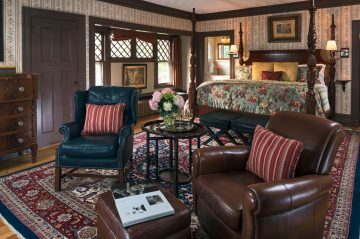 The Country French Suite is an elegant escape on the third floor with a queen sized antique French bed and yellow and green matelassé bedding. 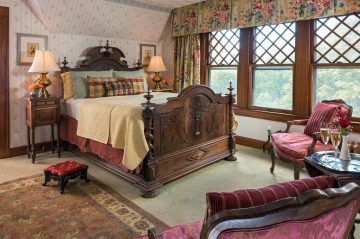 The suite has three large windows that overlook the rear grounds and garden.